If you're a survivalist, you need this in your bug-out bag. Much handier than carrying a bow (and easier to use, too). 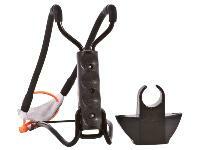 You can quickly shoot small game with the Marksman 3075 Pocket Hunter folding slingshot. 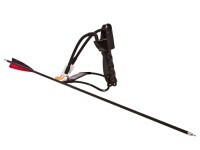 Because the arrow guide is removable, you can also use regular slingshot ammo. The Pathfinder School is a survivalist training school and retailer of unique items for bugout bags. They came up with this design and licensed it to Marksman. 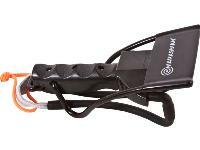 It's a clever design and a useful, inexpensive tool that every survivalist should have. 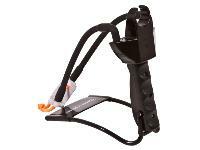 Even if you're not interested in survivalism, this will be a fun slingshot to have because everyone else's slingshot is shooting round ammo, not arrows. Things I liked: The fact that a slingshot can shoot an ARROW! Yes, it works. 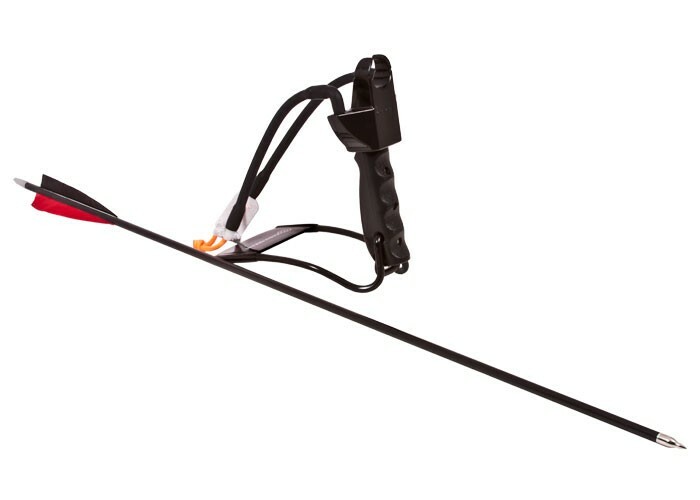 I havent tested it for grouping or comparing it to my recurve bow though. But it works. Its not a joke, and hits pretty hard. Things I would have changed: Hard to transition back to a regular slingshot. I think that regular bowstring would be better than paracord (or whatever it is). Stretching in bowstring is not good. Things I liked: Lot's of fun to use! Just like a slingshot only better! Does this slingbow have a fishing attachment and if so where can I buy it? 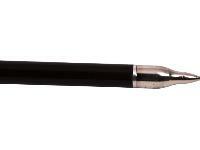 I have a question, Now does any particular "Arrow" work with this, as in length. weight, broad-head, etc,. I currently own a Barnett Panzer V that shoots 18" bolts, would I be able to use the same arrows/bolts with this set-up, or would I need to purchase regular "Archery" Arrows in the 20-22" range, and just use "Field-Points?,, Thank You, Andy. In response to Aaron's answer: I think you meant vanes, not "veins". Also, it's a little hard to tell what you meant by "The flat and moon necks [sic] used but crossbow bolts are incompatible." That doesn't seem like a complete sentence. 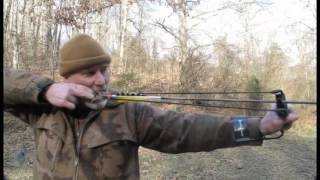 You can use any length arrow however the shorter ones may not allow you to make a full draw causing a drop in velocity and power. 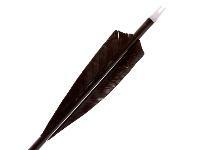 You should also use feathers instead of veins because the type of arrow rest that this slingshot uses may deform veins. 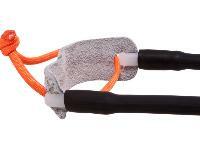 This slingshot also requires the same nock used by a bow. The flat and moon necks used but crossbow bolts are incompatible. You can use any arrowhead with this but since it's velocity is so low the heavier heads will cause more drop at range than they do on faster compound bows. How does it like carbon arrows? 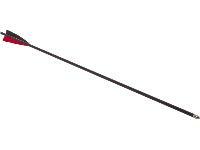 it would probably like carbon over aluminum arrows just because of the weight difference.